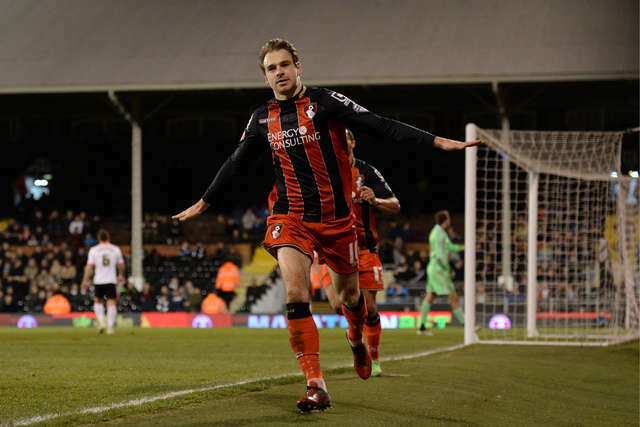 afcb.co.uk has been speaking to some of the key figures in AFC Bournemouth's rise from League Two to the Premier League, including Brett Pitman. I played in a trial game for Jersey under-18s against Bournemouth under-18s and I scored four goals. Joe Roach signed me soon after and by the start of the next season I had moved to Bournemouth and away from home for the first time in my life. Eddie getting the manager’s job was important for me. I knew him well already and he gave me the platform to play every week, which gave me more of an opportunity to show what I could do. Fletch will tell you that he scored the goal that kept AFC Bournemouth up, but everyone seems to forget that there were two or three games after that! He seems to like telling people it was his goal against Grimsby that did it, so we’ll just leave him to it. I think I played every game in the League Two promotion season, and scored 28 goals which was a great personal achievement. We didn’t have anymore than about 13 or 14 players throughout the season, maybe a couple of loans, so it was a special season that really got the club moving in the right direction. I was scoring week in week out and still couldn’t please everybody. I am not one who plays up to the crowd and uses social media to win people over, that’s just not really me. I just concentrated on playing football and keeping the rest of the team and my manager happy. When I found out about Bristol City’s interest I was on my way to Tranmere to play for Bournemouth, which I was more than happy to do. I was happy to stay at Bournemouth if no one else had come in, but I think ultimately the time was right for the club to sell. My move back to Bournemouth had been talked about for a little while, even before Eddie had come back to the club. I remember going to the manager at Bristol City and saying I wanted to go back, and he was good enough to let it happen. I remember driving back the night before I was due to sign and was buzzing about it. It was nice to come back to play for a manager that wanted you, a club that was ambitious and live in an area which I love. I’d lost my bank card and Eddie said he didn’t want me to wear jeans when I was introduced to the crowd. Someone had to lend me some money to go and buy some new trousers! We were head and shoulders above every other team in the league at the time. If we had had Eddie in charge and the team that we had from the start of the season, we would have got over 100 points. I really believe that. I got injured against Real Madrid and endured a frustrating season personally after that. As a team we finished strongly and just missed out on the playoffs in the end, which probably in hindsight was a good thing as we may not quite have been ready to go up. I was more than happy with my contribution last season, I scored 14 goals and played about 40 games. My highlight would definitely be Fulham away; I went back there recently with Ipswich and it brought back some great memories. After our promotion I didn’t go to Las Vegas with the rest of the boys because I was booked on a coaching course. I have been to Vegas twice before so I knew what I was missing, but the course was something I felt was more important for me to do. After the season Eddie came to my house and said: "Look, it’s going to be difficult for you to play as much as you would want, and Ipswich are offering you a long contract that is something we can’t offer you at the moment." He said, "If you want to stay I am more than happy, but if you go it would be with my best wishes." We speak regularly and I left on probably better terms than we had ever been on before. My favourite strike partner? I couldn’t pick one, but it’s between Fletch, Callum Wilson and James Hayter. A third spell at the club? You never know in football. I still have my house there and I would love to, but I am not going to make any predictions.